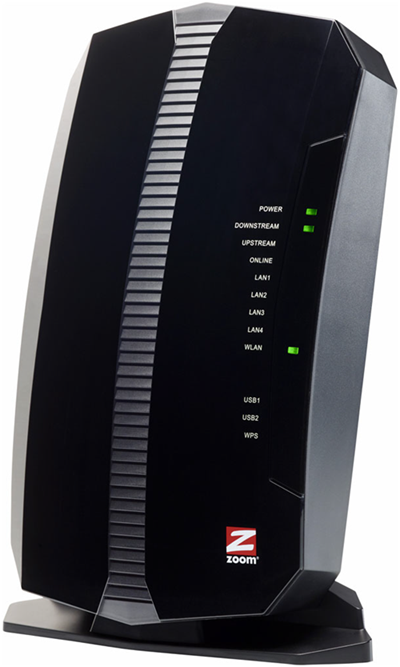 The Zoom / Motorola 5354 is a DOCSIS 3.0 device offering 8 x 4 channel bonding. 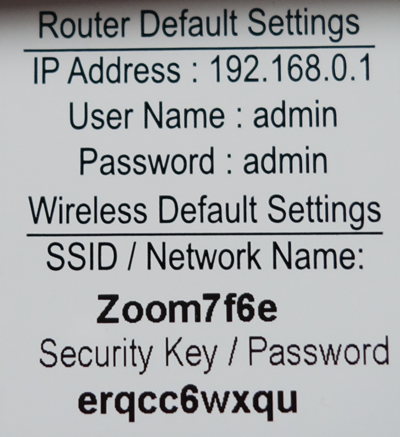 The Zoom 5354 has the following ports and buttons available on the back of the modem. ON / OFF - Turns the modem on and off. POWER - Connects to the power adapter. USB1 - Located on top of device; connects to a USB Flash drive or hard drive. USB2 - Connects to a USB Flash drive or hard drive. WLAN - Press and hold this button for five seconds to turn WiFi connectivity on and off. WPS / RESET - Press and hold this recessed button at least 10 seconds to restore to factory defaults and reboot the modem. LAN 1 2 3 4 - Connects devices to the 10/100/1000 Ethernet port. CABLE - Connects to a coaxial cable. MAC addresses are written as 12 digits containing both letters and numbers (0-9, A-F). A MAC address is unique. The first six characters of the MAC address are unique to the manufacturer of the device. The CM MAC address is located next to the USB1 port on the side of this device. Power LED On None. The modem is powered on. Downstream LED Solid Blue None. Multiple downstream channels are in use. Blinking Blue None. Negotiating multiple downstream bonded channels. Verify all cable connections and try resetting the modem. If cable is OK and modem reset does not work, contact Customer Support. Blinking Green None. Scanning for downstream channels. Verify all cable connections and try resetting the modem. If cable is OK and modem reset does not work, contact Customer Support. Upstream LED Solid Blue None. Multiple upstream channel is in use. Blinking Blue None. Negotiating multiple upstream bonded channels. Verify all cable connections and try resetting the modem. If cable is OK and modem reset does not work, contact Customer Support. Blinking Green None. Scanning for an upstream channel. Verify all cable connections and try resetting the modem. If cable is OK and modem reset does not work, contact Customer Support. Off No upstream channels are in use. Verify all cable connections and try resetting the modem. If cable is OK and modem reset does not work, contact Customer Support. Off The modem is offline. Verify all cable connections and try resetting the modem. If cable is OK and modem reset does not work, contact Customer Support. LAN 1 2 3 4 LEDs Green None. A device is connected to the Ethernet port and is using 1 Gbps LAN speed. Off No device is connected or the device is disabled. Verify all cable connections and try resetting the modem. If cable is OK and modem reset does not work, contact Customer Support. USB 1 2 LEDs Off No device is connected. Solid Green None. USB network attached storage device or media server is connected. Blinking Green None. Reading or writing to a USB device. WLAN LED Off WiFi is not enabled. Press the WLAN button on the back of the modem to ensure WiFi connectivity is enabled. Blinking None. Data is being transferred over the WiFi connection. On None. WiFi is enabled. WPS LED Blinking None. WPS is in discovery mode. For more detailed technical information on the Zoom 5354, use the resources below.